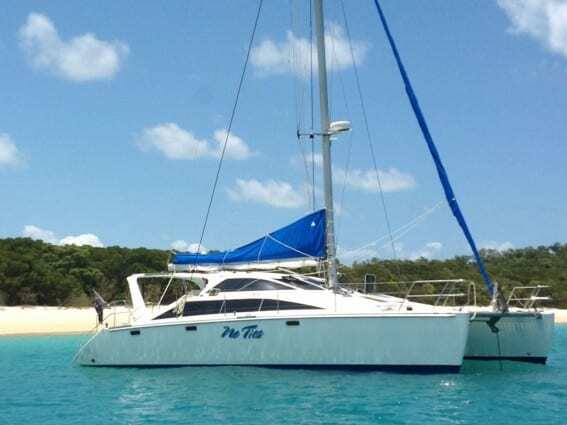 The Seawind 1160 three cabin sailing catamaran has won numerous awards and is the best ventilated boat in the Whitsundays. The Seawind 1160 three cabin sleeps up to eight, with three double cabins and two bathrooms and the saloon table drops down to make another a double. The forward cabins are double beds, the aft cabin a slightly smaller double. A small child bunk is also available in one of the forward cabins. There is ample headroom, generous refrigeration space and plenty of hatches. The unique wide open saloon/cockpit makes for great entertaining. For sailing performance; a full batten main. For easy sailing; all ropes are led to the cockpit, she has a roller furling self tacking headsail and twin steering. What an exciting experience it was to sail your own boat through Whitsundays, picture perfect, we loved it! The staff are super friendly, we never sailed before but training was fantastic and gave us what we needed to sail with confidence and manoeuvre the large cat. Seawind 1160 was fantastic, comfortable, a hotel room on the water. We had great weather which topped our best holiday ever. The Sea Dragon is so well equipped and comfortable! Plenty of shade and easy to sail. Informative briefing with spot on instructions and information!